At an Asheville-area bed and breakfast, waking up is a delicious dream. It’s one of those cold, winter mornings — the kind where almost nothing can lure you from the warmth of your bed. But Dave and Brigette Walters bet their cooking does the trick. The couple maintains the Inn on Mill Creek, a bed and breakfast situated on seven acres inside Pisgah National Forest. Here, they tinker with recipes and dish up sweet and savory breakfast classics. There’s Dave’s potato-crusted ham, vegetable, and cheese quiche; and a frittata surrounded by crispy crescent dough and stuffed with sausage, onions, and roasted peppers. On a sweeter note, there are the pumpkin Belgian waffles. A guest favorite, they’re topped with fresh fruit (from the inn’s 170-tree orchard) and served alongside eggs and sausage. 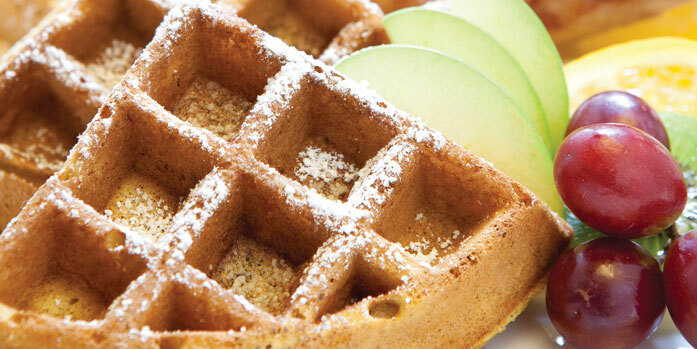 These waffles are sure to bring a bit of warmth to even the most-frigid winter mornings. Combine dry ingredients in a large bowl. In another bowl, lightly whisk together egg yolks; then, one at a time, whisk in butter and margarine, pumpkin, brown sugar, and the milks. Refrigerate wet mix for 5 minutes. Add wet ingredients to flour mixture, stirring until just moistened. In a clean bowl, beat egg whites until soft peaks form, and fold into batter. Refrigerate combined batter for another 5 minutes. Cook in preheated Belgian-waffle iron; this batter will take slightly longer than most other batters (about 5 minutes).